After an early lunch spent sitting in the sun overlooking the Munster main stand and sipping a pint of Guinness the second game came hopping and skipping along with a jaunty Irish jig. This time it was the Sea Peoples, an army of hard-hitting foot that no doubt would also include a handful of Chariots to keep things honest on the flanks. The lists for the Han Chinese and Sea Peoples from this game, as well as all the other lists from the games at Limerick can be seen here in the L'Art de la Guerre Wiki. The table had ended up cluttered with all sorts of terrain, with the Han defending in woodlands for a change - allowing me to put the home-made marsh on table as well. With both flanks well covered or blocked by a waterway I also elected to drive the 2-Chariot micro command straight down the middle of the board between my other 2 commands, figuring that in this game it might provide a crucial cutting edge against enemy Impact foot. The Sea Peoples Elite heavy Infantry were forming a solid line across the open part of the table, advancing as fast as they could to a cataclysmic clash with the Han Heavy Foot line which was hanging back to try and delay the inevitable as long as possible (and also see if they could work a flank advantage as well as the clumsy enemy advanced). On the opposite side the Sea Peoples small but perfectly asinine Chariot force were probing the open spaces near the waterside village as their Medium Foot command considered the possibility of charging across the open-looking boggy ground. The combination of these two terrain types was a near-perfect recreation of the Limerick area, and all that was missing was a circa 200 BC version of Shannon airport and a cardboard cut-out of Keith Duffy over in the flat open space to render it perfectly. With enough troops on both sides to fully occupy the open areas of the table, this looked like a game which would have about as much subtlety and threats of violence as a Conor McGregor pre-fight speech. The two Sea Peoples Heavy Chariots were advancing at pace as their Medium Foot warriors cleared the woodlands on the Han right. Having remembered the outcome of Persian Sparabara trying to stand against chariots at Campaign earlier this year, the Han Mixed Medium Sword/Bow units decided that running into the cover of the woodlands was a much better option than trying to rely on luck and a battle in the open. On the opposite flank the solid mass that was the Sea People Heavy Infantry block had advanced now past the protection of the terrain on its right flank. With the Han infantry deployed well back from the start line, and not advancing either this had created an opportunity for the faster-moving Han Tribal javelinmen to worm their way round the enemy flank and launch an attack. L'Art de la Guerre hint - attacking the flank of a HI block like this is not necessarily going to result in a huge victory as even if the Javelinmen win at Impact, once the HI conform they will still only be on evens (base 1, less 1 for injury =0) against the second-round Javelin factors (base of 0). The advantage however is in thinning the HI line and putting pressure on their pip expenditure by breaking them into 2 groups - both of which should generate further overlap and flanking options later in the game. The looser formation Sea Peoples had decided to go through and over the boggy ground, prompting the Han infantry to step smartly up to the edge of it, meaning that the Sea Peoples foot would be forced to fight them whilst still disadvantaged by the terrain. L'Art de la Guerre hint - Marshes count as Difficult Terrain, so disadvantage even Medium Foot by -1 in combat if any part of their base is in the terrain whilst they are fighting. Impetuous troops are however not forced to charge an enemy if their charge would leave them in a position where terrain will give them a negative combat factor, so in theory the Sea Peoples could just sit and stare back at the Han - but with the Han having shooting capability this is just exchanging a guaranteed slow death for a chance of a brave victory. As the Limerick sidestreets echoed to the footsteps of Bishop Brennan's fried Boiled bacon and cabbage, the Heavy Foot were also starting to take hits from shooting, as well as the attack on their flank by the Javelinmen. But still they pressed on bravely under the incoming fire. Simultaneously across the entire battlefront the two huge blocks of mysterious web-footed warriors charged home, smashing into the Han Heavy Foot and Medium Foot lines praying for their Furious Charge to take effect. This was spectacular - and either way would be brief! In a late night bar named after Father Ted's EU-funded plastic glasses, , the Sea Peoples Heavy Infantry were certainly toughing it out - breaking the Javelinmen who had apparently unwisely attacked their flanks but enjoying somewhat mixed success against the line of Han Heavy Foot and Chariotry they had crashed into frontally. Extra Han units lurked ominously to both flanks of the now-depleted formation. The Medium Foot attack was finding things much more troublesome, with the negative factor from the terrain adding to their inability to claim Impact against the Han steady foot swordsmen. This had resulted in a string of losses for the Sea Peoples, offset by one total breakthrough where they had eliminated the Han Levy at first contact to burst through the Chinese lines. The join between the Sea Peoples Heavy Infantry and medium infantry commands was next to the march - and the Chinese army were inserting two rather pointy chariots into this point of potential weakness at a rate of knots, but unfortunately they were ploughing into the Elite Heavy Foot rather than the more squishy Mediums. Even so, many Euro coins were appearing as hit markers, in a thinly disguised taunt at the only Englishman in the room. Even when the Sea Peoples got their feet firmly onto dry land by bounding out of the marsh they were not having a great time of it. As the streets of Limerick filled with laughter for the festival of Ronan O'Gara's Guinness-infused Boiled bacon and cabbage, the cunningly deployed reserve Chinese cavalry (Impact-free of course) were ready and waiting to take them on frontally, giving the waterborne warriors a lovely choice between either fighting from the Marsh against foot, or being Medium Foot in The Open against Mounted. Yum..
Schlam! The load of bullock (cart)s wheeled round and hurtled at ball-breaking speeds into the Chinese cavalry, who forgot (clearly) that they could have evaded, or possibly decided that their death to a flanking Chariot Charge was a better option than sacrificing the infantry who were actually doing quite well by now. Either way, as the Sea Peoples attack sank without trace in the swamplands the Chinese now had a new threat to deal with. As the early afternoon sunlight streamed in across the rugby pitch the Elite Warriors of Sea Peoplearia were systematically hacking away at the Chinese infantry, in a clash of early iron and late bronze age technology deployed at close quarters. Even as holes developed in the Chinese wall the far flank of the waterborne invasion force was now looking as glaringly exposed as the buttocks of a drunken rugby fan on the back seat of a bus. But the flanking force, despite all its hard work to achieve their position now found itself waiting and out of position like a spare chopstick at a sushi bar - the main body of Chinese foot had already destroyed the attack of the Sea Peoples nobles and so the opportunity to turn and roll up the line was becoming moot. L'Art de la Guerre hint - turning 90 degrees with heavy foot loses you 1 MU (base width) in movement distance, so the Halberdier unit here is now 2 turns away from being able to reach the flank of the enemy line. No-one likes to be surprised by the sight of rampant bullocks close by in in their peripheral vision, especially on a day as warm as this one where pretty much the whole town of Limerick was getting sweaty. So, with the frontal Sea Person attack coming to naught the Chinese were frantically reshuffling their pack and lining up to get run down by the marauding chariotry from a new direction. But would enough of the Sea Peoples army still be left alive to allow their horse-drawn component to achieve another breakthrough? Well, apparently not - the total destruction of the bog-marchers coupled with a stoic resistance sharpened by the Chinese Chariotry's counter attacks had blunted the Sea Peoples resolve to the point at which they simply gave up and went home, back across the sea (presumably) to who knows where! 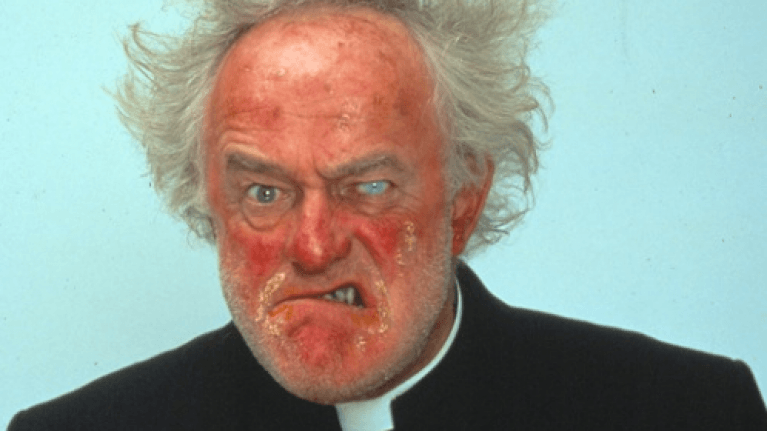 The Result is a "Father Ted" for China - Bishop Brennan has been kicked soundly up the arse!. That did mean that you allowed your main line of halberdiers to be hit frontally in the open by Elite Impetuous Heavy Swordsmen. Like, if you were commanding the enemt army that is pretty much exactly your best matchup available - and a matchup which it was entirely obvious would happen in what was the only clear bit of space anywhere on the table surface too. It must have been luck - and admittedly a bit of nurdling around the edges of the terrain - which meant you came out on top here. The other flank was a much more straightforward and justifiable version of your passive agressive approach, with the enemy attacking bravely but ultimately somewhat hung-overishly out of the Difficult terrain and into your waiting line. Even so, you had little but crossed fingers and a series of losses to come up with a plan to deal with the enemy Chariots on that side of the table. They could easily have taken you down if they had attacked more quickly, so it is a spot of luck that the eagerness of the Warriors outpaced their mounted colleagues attack. Six 15 to 28mm scale "Small trees"